These Fairytale Wedding Pictures will literally sweep you off your feet! Accept it or not, every girl dreams of her fairytale story from ‘Once upon a time’ to ‘...and they lived Happily Ever After’. We recently came across one such beautiful ‘Fairy Tale wedding’ and it’s been really hard for us to take our eyes off it! A beautiful bride who has literally stunned us with her fairytale wedding pictures! 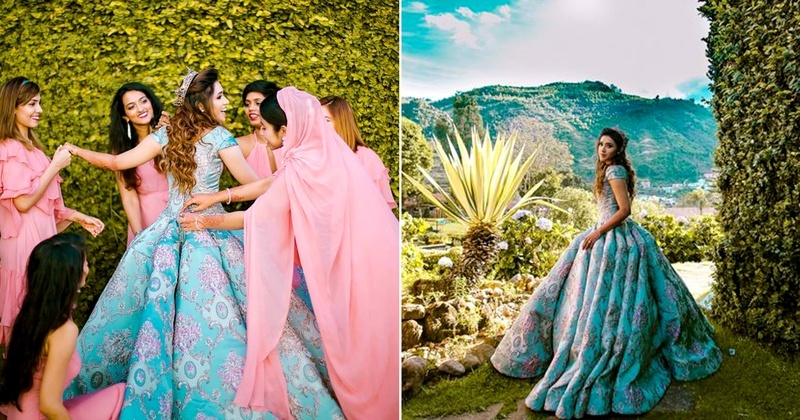 Really can’t enough of this magnificent icy-blue ball gown with pink floral prints and motifs on it! It’s giving us major *Ella Enchanted* feels! And just look at that tiara…. With her ‘One and Only’! Also, kudos to The Photo Diary for taking these breathtaking shots. Her bridesmaids, giving us major #BridesmaidsGoals. What we love the most about their outfits is how they have all selected the same fabric and colour and have styled them according to their own individuality. Because no girl can get married without her lovelies by her side! And, here’s taking a moment to admire the bride and groom’s outfits! Still wandering in a fairy land, will take sometime to get over these pictures! Location - Green Pastures, Kodaikanal, Tamil Nadu.